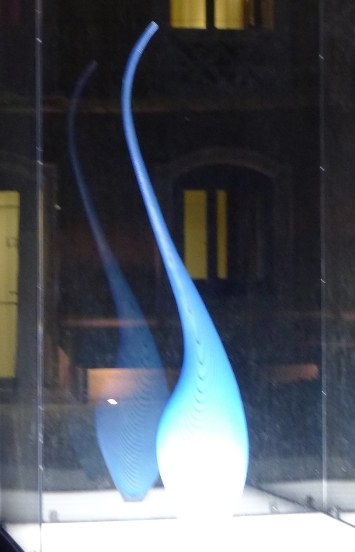 Today we went to the Tagliapietra exhibit in the Palazzo Franchetti (by the Accademia bridge). You begin with a engaging video which has not only the Venetians but nearly every important American Glass Blower. Lino began work in the Seguso furnace at 11 years old as an apprentice. He went on to teach extensively in the US at Philchuck with Dale Chihuly. He is valued by the glass artist around the world for his role as mentor and teacher, in the society of Murano who holds their secrets close. The depth and breath of his work and technique is amazing, and covers from 1954 to 2011. Of course the Palazzo Franchetti (constructed in 1565) is also magnificent. To bad they wouldn’t let me make pictures. I did buy the book and will put some up on the web that I can find.